At WhatSheds, we know just how hard buying a log cabin can be. There are loads of different makes and models, along with a plethora of manufacturers all vying for your attention. It is with a deep understanding of these issues that we create our reviews of the leading manufacturers’ cabins. Drawing on years of experience and site visits, we provide would-be cabin owners with useful, impartial advice to help with this important decision. Today’s review focuses on The Lakra 44mm log cabin from TigerSheds. First impressions of the building are that it would make a great summerhouse, thanks to its spacious sunshade canopy. 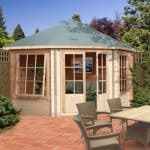 Alternatively, this can double as somewhere to take refuge from those pesky summer showers! Although we couldn’t view this specific model on our visit to the company showroom in Leeds, we were able to inspect the quality of The Shere, The Procas, and The Rho – all of which share the same basic construction methods as The Lakra. Anyway, it’s time to have a proper look around The Lakra, if you’d care to join us! Quality construction materials and methods used throughout. Company owns its own mill. Lacks the “wow-factor” of some models with more spectacular roof designs. The Lakra cabin is available in four different sizes. These are listed in the table below. However, since the company operates its own mill, additional dimensions can be requested. 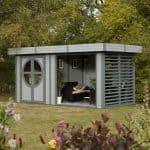 TigerSheds makes it their mission to be as accommodating as possible to customers and this is clearly evidenced by their flexibility when it comes to such design choices. Just contact a sales representative at the company to discuss alternate dimensions to those seen below. In terms of height, The Lakra stands at an impressive 2438mm. This gives ample headroom for taller cabin users or additional storage. It’s also great because it means that the entire range will be compliant with planning regulations. Some local councils demand that all garden buildings be lower than 2.5m if they are positioned within a 2m radius of a house. Thanks to its space-saving pent roof design, The Lakra is regulatorily-compliant, even without requesting a reduction in height. 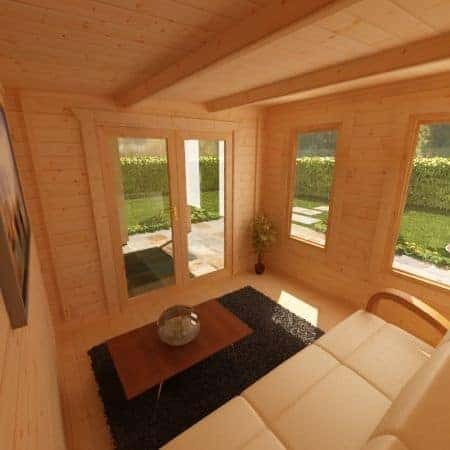 As with the rest of the 44mm log cabin range from TigerSheds, The Lakra is constructed using European redwood throughout. This slow-grown building material is far more hardwearing than the cheaper alternatives used by some of the company’s competitors to reduce costs. Many firms use Baltic white wood, a species of tree that grows much faster than the European redwood and is therefore much more prone to warping and splitting. The redwood used also offers superior visual appeal since knots are less common and the wood has a naturally smoother finish. TigerSheds actually owns a mill in Yorkshire. This is where it sources all the materials from for its log cabins. Something of anomaly in the industry, we were really impressed by the fact that the company cuts all wood to order. The resulting cabin is much less likely to have its quality compromised during improper transit or storage. The TigerSheds’s mill is also what gives the company the ability to offer such extensive customisation options. 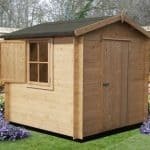 All TigerSheds log cabins are supplied untreated and the company does not include a suitable treatment within the price. This is one of the few drawbacks we found with the service offered. Treatment of the wood is vital to ensure that the cabin stands for many years to come. We therefore thought it a little on the stingy side for the company to not include a basic treatment as standard, with the option to upgrade. That said, TigerSheds does carry two different treatments that can be added to any of its 44mm cabins for a price. Firstly, there is the firm’s own product, TigerCare Protections. This comes in three different colours – Red Cedar, Oak, Mahogany – as well as clear. Alternatively, the company stocks Cuprinol Garden Shades in some rather more exciting colours. The range stocked comprises of Seagrass, Pale Jasmine, Forget-me-not, Summer Damson, Olde English Oak, and Black Ash. The walls to The Lakra cabin are absolutely rock solid. Even from a glance you can see the workmanship that goes into the buildings. The outside corners of the cabin itself showcase the superior building materials and construction methods opted for by TigerSheds. The 44mm four-way chamfered logs, connected using a double tongue and groove system, protrude at the corners of the structure. Seeing the mighty cross sections of the logs really inspires confidence in the longevity, security, and weather-resistance of The Lakra. Some competitors do not chamfer their logs, and this can result in a much less attractive finish product. Others might use a square cut notch joint. Whilst cheaper upfront, this usually results in a much sloppier joint that is susceptible to penetration by the elements. We’re pleased to report that this is not the case with TigerSheds’s products. Although lacking some of the splendour of a full apex or reverse apex roof, the pent design (single sloping roof) actually has some great advantages. The chief of these is that The Lakra is compliant with local planning regulations without modification. Examples from the 44mm range that require adjustment include The Shere and The Procas. These two options both have a serious “wow factor” but in reducing the height (which TigerSheds will do for free), the structure loses significant headroom and storage space. This is because the walls themselves must be lowered to drop the highest point of the roof. Being a pent roof, this isn’t the case with The Lakra. The roof and outside canopy area are constructed using 44x120mm rebated purlins. Again, this choice of material is over and above what TigerSheds could get away with and the gapless finish created is testament to the company’s customer-focused service. This robust framework supports 19mm planed tongue and groove roofing boards – again, an excellent choice to ensure longevity and weather-resistance. The entire roof is bordered tastefully with extra thick panels hiding the construction work beneath. 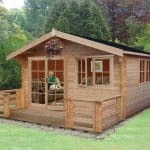 This gives the cabin a real “finished” look – something not offered on every log cabin, even some of TigerSheds’s products haven’t quite been finished so pleasingly. The thing that really makes The Lakra stand out from the rest of the 44mm range is its spacious, covered outdoor area. Walled on two and a half sides, this extended porch area is ideal to take refugee from the occasional blast on UK sunshine or, more likely, the perpetual British drizzle! Either way, the entire canopy is kept aloft with a study-looking support, which adds a lot of character to the cabin. The roof is finished with heavy duty green mineral felt as standard. This provides excellent weather-resistance. From feeling the default roof covering of the 44mm cabins in Leeds for ourselves, we’re more than confident in its ability to provide years of shelter. We were pleased to learn that TigerSheds also includes this covering within the basic asking price for The Lakra. There has been no effort to lure customers in with a lower price, only to inform them later than “optional extras” are more like absolute necessities. Although more than tough enough to provide years’ worth of protection from all that a British winter can throw at it, the mineral felt can be upgraded at a cost. We recommend those wanting to really get creative with the style of their new cabin to consider adding roofing shingles. These are available in a range of colours – black, red, green, and brown – and they’re actually the same as those you’d find on a house. Another extra that can be included for The Lakras range is guttering. This costs extra and comes pre-attached to boards so it’s ready to be nailed onto the cabin. We really liked that TigerSheds has made the installation of such extras as easy as possible. This means that many customers will be able to pass on the rather expensive professional installation fees. One of the biggest weaknesses of log cabins is moisture from beneath. Without adequately protected bearers and a sturdy floor, cabins can literally rot underfoot! Fortunately, TigerSheds have taken every precaution possible to ensure that this is not the fate of your new cabin. The floor is supported by 44x57mm pressure treated bearers. These are positioned at 400mm centres – just as they would be in most homes. Atop this weather-resistant and robust frame is 19mm planed, heavy duty floor boards. These are joined using tongue and groove to provide an exceptional level of quality. Although we were not able to inspect The Lakras cabin in Leeds, the floor is identical in both materials and construction methods to those we did view. We were therefore able to get a great idea of its quality from looking at the other cabins on display at the showroom. The rigidity of hese floors is something that seriously impressed us. It simply does not budge at all! We find the entry-level flooring solution provided by TigerSheds to be more than sturdy enough to deal with everything your average family will throw at it. However, those opting to use the building as a workshop space might consider upgrading to a thicker floor. We have seen manufacturers attempt to wow customers with an exceptional price and once they have their interest, it’s revealed that the cabin’s floor needs upgrading. Others will list a price that doesn’t include a floor! Yes, this really happens. One area that many manufacturers will save some money on is doors and windows. They are often poorly finished or built using inferior materials. We’ve even seen some try to include plastic windows to save a bit of money! Fortunately, TigerSheds does not let up in its pursuit for quality here. The Lakras cabin comes with beautiful full pane double doors as standard. These let in loads of light and make the building highly accessible – even when carrying in large furniture. European – simple elegant design, gives a modern look. Georgian – gives cabins a real “cottage-in-the-woods” vibe. PVC – the height of safety and insulation. Comes with double glazing as standard. Fully-boarded – workshop style for when functionality is more important than aesthetics. Since both doors and windows are full pane as standard, The Lakras is also supplied with free 4mm toughened glass. This can be upgraded to double glazing for a price. Although this will surely increase the insulative properties of the cabin, such an upgrade is not strictly necessary. The entry-level glass is fully draft sealed and both internally and externally beaded. Such high-quality glazing is not universal across all garden building manufacturers. Each of the door and window styles has been crafted by TigerSheds’s inhouse joinery team. This is obvious from small touches such as the tasteful architraves inside and out, as well as the fact that they are rebated into their frames. Many competitors cut corners here and offer their cabins with a much lower overall standard of finish. Others will save by hanging doors externally with low quality pin hinges. This makes the wood itself more likely to twist or warp. By contrast, TigerSheds use much higher quality hinges and actually recess them into the woodwork. This makes gaining entry to a locked cabin much more difficult, even when using a crowbar or other such tool. On the subject of security, The Lakras comes with a high-quality, three lever mortice lock as standard. Again, other manufacturers have been known to save a bit of money here by providing only an inferior European cylinder lock. For TigerSheds, however, this is not good enough. Their entry-level lock system is the same as those used on the front door of a house. Meanwhile, additional protection is provided on the doors with a bolt lock top and bottom. For the particularly security-conscious, a range of security lights, alarm systems, and lock upgrades are also available. As you can see, The Lakras can be customised in loads of ways to make it more visually appealing or functional for customers. Colour can be added with shingles and different wood stains, whilst style is taken care of with a range of different windows and doors. However, there are a few other options that are worth mentioning. Firstly, both flower beds and planters can be included for the outside space, as can decking. Designs can also be customised further at the customer’s request – another benefit of the company providing its own mill. This might include the placement of windows or doors, the inclusion of additional windows and doors, the adding of partitions, and other such stylistic choices. However, the sales module on the TigerSheds website really isn’t great. Many of the options that we know are available from conversations with sales representatives are not listed as upgrades. We recommend those wanting to include one of the upgrades mentioned here but cannot see it to contact the company directly. TigerSheds is really committed to customer satisfaction so they’re often willing to go the extra mile to provide customers with exactly the right cabin, even if their existing products require some tweaks. As you can see, The Lakras is a high-quality cabin. By this point in the review you might be almost sold. However, one large question likely remains – how are you going to get this vast garden building home?! Well, fortunately, TigerSheds has you covered here. The company provides a free delivery service using its own 18-ton HIAB truck with built-in crane. Many competitors will charge for delivery and then not even possess the correct tools themselves to ensure a professional job is done. For example, some might deliver a cabin by hand – inviting a greater change of components becoming damaged during delivery – and others may outsource the task to a third-party. If a piece is damaged by a company providing delivery services for the manufacturer, it can be much more difficult to get the manufacturer to accept responsibility for the damage. Fortunately, this isn’t the case with TigerSheds. To make delivery even more easy, the company provides a range of two-hour delivery times and allows customers to pick one themselves. Such touches demonstrate that the firm strives to minimise the disruption caused to busy customers’ schedules by the delivery and installation process and we must commend their commitment to an exceptional service once again. Installation of The Lakras has been made as easy as possible and anyone with any sort of DIY experience should have no trouble erecting it. However, for those suffering mobility issues or the elderly, a full professional installation service can be included. This isn’t cheap but for some it is the only option. Meanwhile, others will likely choose it simply to ensure that TigerSheds takes full responsibility for all aspects of the quality of their new cabin. 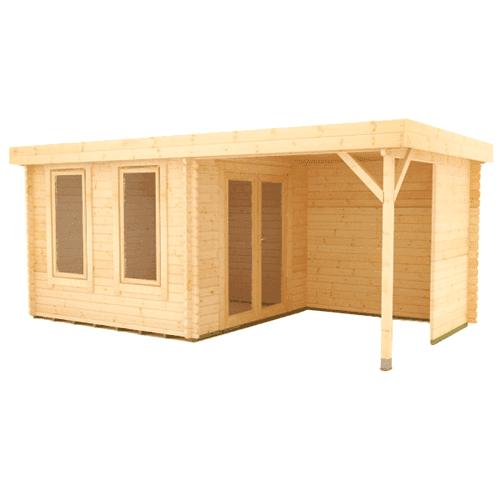 Those wanting a spacious, multifunctional log cabin can do much worse than The Lakras by TigerSheds. The model offers customers a light and airy inside area with a partially exposed sun/rain shelter outside. We reckon the space would be ideal for an afternoon barbecue turning into a summer evening garden party! 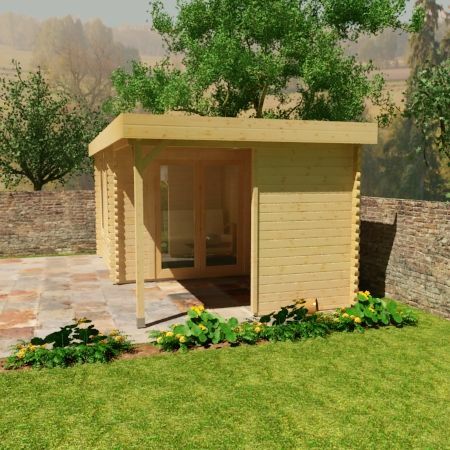 The construction methods used throughout the cabin highlight the manufacturer’s commitment to providing exceptionally high-quality garden buildings. On many occasions during the process of reviewing The Lakras we were blown away by how much over-and-above the minimum accepted standard TigerSheds had gone to ensure their cabins really are amongst the best in the business. 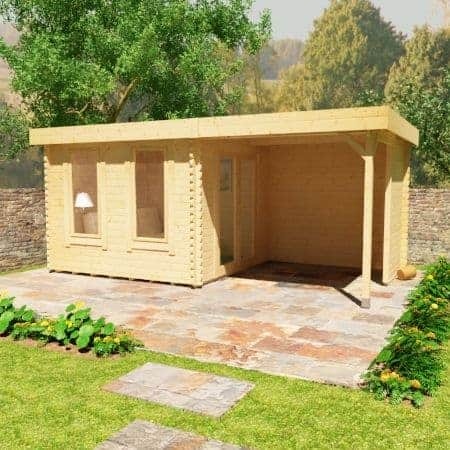 Put simply, the 44mm cabin range by TigerSheds comes highly recommended by us.